The genesis of something very, very special occured in a tiny tin shed in Hope, Arkansas in 1946 when Paul W. Klipsch (PWK), genius, madman and maverick, designed and hand built the legendary Klipschorn® speaker to enable people, for the first time ever, to experience the power, detail and emotion of a live performance at home. As the only speaker in the world to be in continuous production for over 70 years, the Klipschorn has remained relatively unchanged since its inception. The Klipschorn enclosure is still made in the USA, by proud craftsmen in Hope, Arkansas. Just like Paul W. Klipsch (PWK) intended. The Klipschorn is the only fully horn-loaded loudspeaker available to the consumer market which is designed to operate in a corner. With its three-way system, each driver is coupled to an exponential horn and optimized to operate in its individual pass-band. This allows the Klipschorn to be a staggering 10 to 20 times more efficient than other conventional loudspeakers. Higher efficiency yields greater acoustic power, which is generated with considerably less effort from the loudspeaker’s diaphragm. The result is the cleanest, most dynamic sound possible throughout the entire musical range. 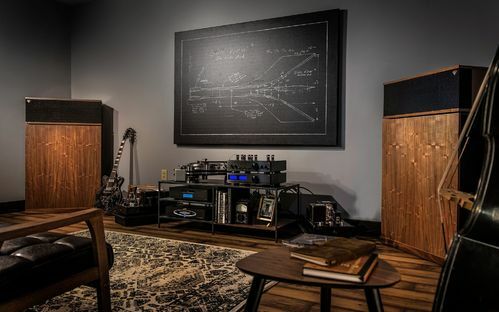 While each and every component of the Klipschorn is built to last, Klipsch has always recognized the unique and critical role of a loudspeaker’s cabinet in the sound reproduction process. From the craftsmen in Hope, AR to the engineers in Indianapolis, IN, Klipsch has always put an extraordinary emphasis on cabinet design. Crafted from over a hundred wood panels, the Klipschorn enclosure is assembled using only the highest-grade adhesives and fasteners. This is a speaker you will hand down from generation to generation.